Some people are reporting problems getting this site to process their addresses. We are working on it. In the mean time, you might try going directly through paypal?? 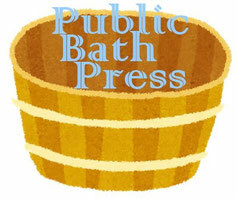 Public Bath Press uses a mail address on paypal that is: hopkat1japan@yahoo.co.jp. Don't really want to post that here (spamstore coming?) but I want to get the book to as many people as possible! Record stores in Osaka are selling a lot! Book and music stores!! Contact us for wholesale ordering information!! !A notice to non-Japanese speaking customers! Due to the website's layout the order form does not currently allow for English descriptions on how to write your personal information. We have listed the information and the order in which the form will ask to be filled out. We suggest opening the shopping cart in a separate window and referring back to this list. And, perhaps most importantly, if this is all confusing, you can contact us with an email and buy the book or magazine directly by just using paypal. Use contact button above, or write to hopkat1japan@yahoo.co.jp Paypal has a currency conversion button where you can send us Japanese yen. We ship from Nara prefecture. That should show you your shipping options. This could save time. It isn't hard to use the P.O. 's English tool. Currently SAL rates are not available for France, Spain or Netherlands, according to the post office. Or just write us an email to ask.